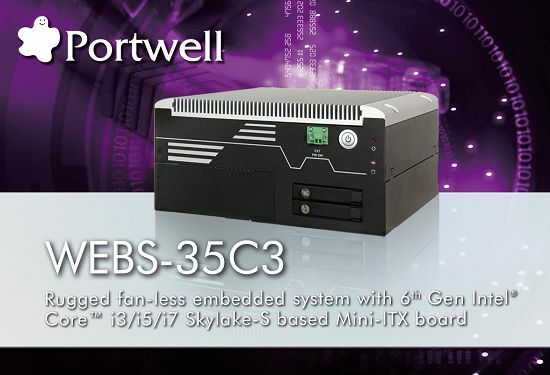 Portwell (http://www.portwell.com.tw), a world-leading innovator in the industrial PC (IPC) industry and an Associate member of the Intel® Internet of Things (IoT) Solutions Alliance, announces WEBS-35C3, a high performance fan-less Box PC. Powered by the 6th generation Intel® Core™ processor (formerly codenamed Skylake-S) with integrated Intel® Gen9 graphics engine, the WEBS-35C3 system supports high-resolution triple-display output, serving as an ideal platform for performance and graphics-demanding applications. ortwell’s WEBS-35C3 is designed to be power-optimized and value-optimized. Instead of adopting a mobile CPU like a traditional embedded system, WEBS-35C3 utilizes a 35W Intel® desktop CPU and Intel® Q170 chipset, which is more economical compared to its mobile counterpart and provides great efficacy as well as low power consumption; this makes WEBS-35C3 not only competitive but outstanding in the market. The system further takes advantage of the 6th generation Intel® Core™ processor technologies supporting dual-channel DDR4 memory up to 32GB. 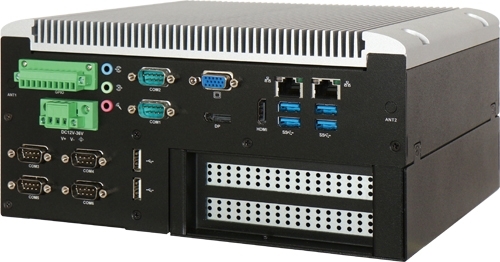 Furthermore, the WEBS-35C3 Box PC includes rich I/O interfaces and fast connectivity with three independent display (DisplayPort/HDMI/VGA) interfaces with resolution up to 4K, two Gigabit Ethernet ports, two RS-232/422/485 ports, four RS-232 ports, two USB 2.0 and four USB 3.0 ports, one 8 bits GPIO port, and Mic-in/Line-in/Line-out. Optional wireless, 3G or LTE modules can be added via a Mini PCIe slot or M.2 socket. In addition, the embedded board that drives the WEBS-35C3 system features an innovative PCI/PCIe expansion module. Users can easily maintain or replace the PCI/PCIe module via a unique gold finger design or extended from PCIex16 slot. Moreover, thanks to the isolated chamber that accommodates an add-on card separately, the system’s thermal design is optimized to further maintain operation stability. Additional thermal solutions, such as a customized heat spreader, can be implemented to realize a truly rugged fan-less system with diversified add-on cards. Expansion interfaces include 2x PCIe x1, 1x PCI and 1x PCIe x1, and 2x PCIe x8. The rugged, fan-less design makes the WEBS-35C3 durable in harsh environment applications, such as factory automation and industrial automation. Portwell’s WEBS-35C3 has already passed a vibration test of 5Grms/ 5~500Hz and a shock test of 50G, assuring its solidity and reliability. In addition, the system accepts a wide input voltage range from 12V to 36V. This power-source flexibility enables product usage in a variety of situations. Moreover, the WEBS-35C3 is more than a robust and dependable embedded system with high performance and graphics efficacy, its stylish mechanical design enhances the system’s artistry. Potential applications include kiosk, intelligent digital security, IVI, factory automation and surveillance applications, and many more.